UPDATE (4:52 p.m.): The dress code issued Monday was rescinded because Wos hadn’t approved the policy, according to Julie Henry, DHHS’ communications director. UPDATE (2:56 p.m.): The new DHHS dress code issued by the agency Monday may be recalled Wednesday afternoon because Wos hadn’t signed off on the policy, according to an email from human resources staff sent to DHHS employees. (A copy of the email was obtained by N.C. Policy Watch.) We’ve got calls in to DHHS to find out more about the situation, and will update this post as we hear more. 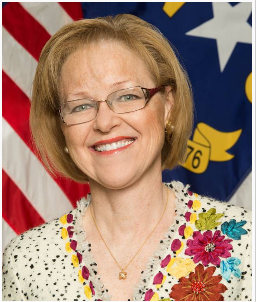 The N.C. Department of Health and Human Services, in what appears to be one of the first big directives for newly-appointed Secretary Aldona Wos, has a dress code at last, with unkempt appearances at the workplace not to be tolerated. The new dress code (click here to see) was announced on Monday, and requires daily bathing and grooming, among other things. Gone are dress-down Fridays. The 17,000-plus state agency previously hadn’t had a department-wide dress code, according to Julie Henry, a spokeswoman for the department. On the “What not to Wear” list (no word if Clinton and Stacy of the similary-named TLC show were consulted) are leggings, pants below the waist, denim, “underwear as outerwear,” evening wear and sunglasses, unless there’s a documented medical reason to wear shades. Nixed were proposals made in earlier drafts to keep skirts within an inch of a woman’s knee, draft documents of the dress code show. Violations of the dress code are considered “unacceptable personal conduct” and employees that show up with clothing on the “do not wear” list will have to leave work and return in appropriate attire. A third violation could mean being fired. N.C. Policy Watch had gotten wind of the changes afoot several weeks ago, and submitted a public records request on Jan. 16. 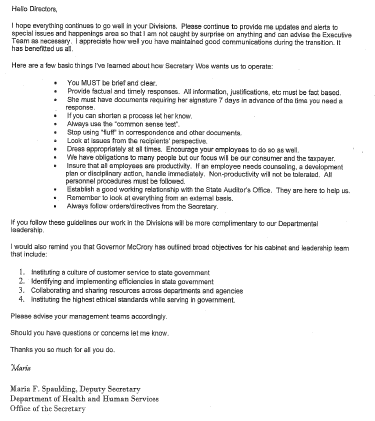 In documents released Tuesday by DHHS in response to the request, top directors at the department were informed early on in Wos’ tenure that employee attire was a top concern, as seen in a list of her preferences sent in a Jan. 17 email to DHHS directors by Maria Spaulding, a deputy secretary at DHHS. Also on the list was having a good working relationship with office of State Auditor Beth Wood (who appeared with Gov. Pat McCrory and Wos last week at a press conference to talk about budget overruns in the state Medicaid office); following directives from Wos; and to stop using “fluff” in work correspondence. Please keep us updated. This has generated a LOT of necessary/unnecessary conversation among the “afflicted”! News from DHHS deserving a press conference, must be important stuff. Is Aldona Wos the Secretary of DHHS or the Mommy of DHHS? How will daily bathing, now required of state employees at DHHS, be monitored and enforced? Does Wos have some sort of Bathe-O-Meter that state employees walk through as they enter the building each morning? Daily grooming is pretty straight forward, but what does “among other things” include? I can hear it now. Wos: Mr. Smith, the Bathe-O-Meter indicates you didn’t bathe this morning. What do you have to say for yourself? I visit DHHS offices a few times a year and I haven’t seen unwashed, untidy or disheveled state employees walking around the halls. So I guess I need to walk a mile in Wos’ pumps to understand what she sees. from the deputy secretary’s statement – “Insure that all employees are productivity.” Two grammatical errors in a single sentence. Perhaps the emphasis on professionalism could include written communication skills as well. What she does is raise money for the GOP. I suspect that most of her time will continue to be spent in that capacity, except for the rare occasion that she visits the office to cut budgets and torment some lazy, good-for-nothing state workers. Not all DHHS employees sit behind a desk. Some (i.e. early intervention) trudge through muddy driveways, up rocky terraine to sit on a couch that may be sticky from god knows what, coverd in dog hair, and smoke filled. Playing with kids on the ground, being spit up on by infants, a toddler’s peanut butter fingers. I don’t think it is appropriate to impose a 1950’s style dress code on every dhhs employee, as our work differs greatly from department to department. P.S. no one under women 60 owns a pair of pants that goes up to the the waist. “Leggings, pants below the waist, denim, “underwear as outerwear,” evening wear and sunglasses,”…well, there goes my entire work wardrobe! As a DHHS employee I would love nothing more than to be more productive. I believe in the work we do and think it’s important, but basic day-to-day business processes take so much time and energy it’s quite difficult to get anything done. It can take over 16 months to hire people in critical roles–even when the funding is 100% federal–NO STATE FUNDS, but all the hang ups are because of state budget rules. I’ve seen it take over a year to order and have a computer set up (again, using all federal money). With new requirements that Vos have two weeks to review all grants before being submitted, staff is left with one or two days to write 100 page proposals. When comments come back they have to do with comma placement, not useful feedback on the proposal and how it could better serve the people of North Carolina (also known as those almighty customers). Yet the folks I work with remain committed, upbeat, positive, and doing everything they can to ensure the health and safety of the people of this state. I’d love it if the answer were as easy as nicer outfits, but those types of superficial actions are completely naive and insulting. My confidence in Vos as a leader is gone. After the auditor’s report, I hope all the employees are not positive, upbeat and doing everything to ensure things remain as usual. The numbers do not lie. There is gross mismanagement at DHHS not to mention the waste of nearly a billion dollars in taxpayers money and that has nothing to do with the state budget. With additional money from the GA, only more abuse continued to rise. Again, read the report. I hope you have a copy of the report. I hope you were not posting during your work day.